Reaching 100 years is an accomplishment that deserves to be celebrated by any organization. 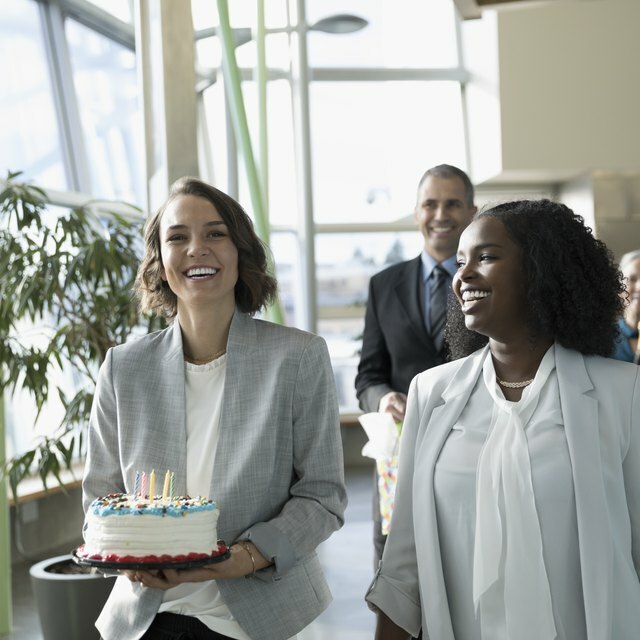 A centennial celebration is a chance to recognize past accomplishments and remind both employees and customers of the organization's long history. One-hundredth anniversary parties can incorporate plates, balloons, banners and other decorations with the number 100, but there also are other subtler ways to celebrate and market this milestone throughout the centennial year. Providing every guest and employee with the traditional 100th anniversary gift of a 10-carat diamond is beyond the means of most organizations, so consider using diamond-shaped glass as a part of the centrepiece arrangements for each table at a centennial party and as a part of your decorating scheme. If the budget allows, include diamond jewelry in draws for door prizes. A majestic, multiple-tier anniversary cake also makes an eye-catching statement for centennial celebrations. Make each layer a different corporate color or have corporate mottos or words from the organization's mission statement written on the top or sides of each level. Showcasing items from 100 years ago can add excitement to your celebration, especially if participants can touch the items or have their pictures taken with them. There are many ways to incorporate 100-year-old items into the organization's anniversary celebrations. Consider holding a heritage day and displaying old documents, projects or corporate newsletters. You can display old photos of the organization's headquarters or past workers or products. One way to bring the past to life is to display items related to the organization. For example, a car company can hold a classic car show or an organization related to clothing can hold a fashion show displaying 100-year-old fashions. An organization that prints a catalogue or newsletter can reprint an old edition as a collector's item. Add a modern twist and create a centennial webpage for the corporate website. Share photos and stories from the past century. Also create a page that highlights the anniversary celebrations and activities. In order to celebrate the centennial throughout the year, take advantage of the added excitement by incorporating holiday celebrations. For example, for its centennial celebration, the North Carolina Cooperative Extension recommended decorating a Christmas tree with ornaments modelled on those from 1913, the year the organization started. Take it a step further by serving food based on 100-year-old recipes at the organization's holiday party or centennial party. A centennial celebration held close to Halloween could feature pictures of costumes from 100 years before. Consider your company's history and strengths and brainstorm holiday or monthly events. These help keep your company, and it's trusted reputation, top of mind for customers. Consider giving longtime customers a special gift to commemorate the relationship and build loyalty. For organizations that have the room, a centennial garden can commemorate the occasion for years to come. This decoration will beautify the organization's headquarters while reminding visitors that the organization has a long, trusted history. Larger organizations also can build a parade float to commemorate the 100th anniversary. This float can be used as a decoration at a centennial party as well as an exciting addition to local celebrations. To generate awareness, add the anniversary into your business logo for the year. A graphic designer can add a small "100th anniversary" burst to the end or bottom of the logo. Placement is important so you don't disrupt the logo or make it too busy for the eye to easily read.Think about any unique assets your brand has built over the decades and think about creating a fun logo that may not even have your company name. When Batman celebrated its 75th anniversary, DC Comics used a special anniversary Batman logo. The black and white logo featuring Batman's iconic cape with "75" in the corner. Beneath the cape was the special anniversary tagline "75 years of Batman". Marketing expert Paul Provost, the president of 6P Marketing, recommends adding your anniversary logo to corporate stationery, in-store and office signage, advertising, the corporate website and employee email signatures.